Who is Entitled to Attend Board Meetings on an Owner’s Behalf? 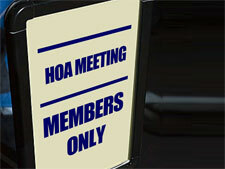 Membership rights with regard to the attendance and participation in Board meetings is an important component of the laws governing homeowners associations (“HOAs”). Civil Code Section 1363.05, known as the “Common Interest Development Open Meeting Act,” states that “any member of the [HOA] may attend meetings of the board of directions…” This right is central to keeping HOA members apprised of the issues affecting their community and the ways in which the Board is discharging its duties under the HOA’s governing documents. However, one issue that surfaces from time to time deals with the extent to which a HOA is required to allow a member to attend a Board meeting with her attorney, or to allow the member’s attorney or agent to attend the Board meeting on the member’s behalf. This issue may be complicated further if the owner of a property (the “member” under the HOA’s governing documents) is an entity (i.e., a business organization or family trust). In SB Liberty, members of the HOA, the Shorts, held their property in a family trust and eventually in a wholly owned LLC, “SB Liberty LLC,” which named the owners as the designated managers and officers of the LLC. In relation to an ongoing architectural dispute between the Shorts and the HOA, the Shorts requested that their attorney attend a scheduled Board meeting on their behalves. Upon being notified by the Short’s attorney of his anticipated attendance at the upcoming Board meeting, the attorney for the HOA informed him that he was not entitled to attend Board meetings, and that his attendance at the same would violate certain ethical rules prohibiting communications with represented parties without the permission of their counsel. Despite the HOA’s denial, the attorney for the Shorts reiterated his intent to attend the meeting as “the representative” of his clients. On the day of the meeting, the Short’s attorney showed up as indicated, and refused to leave, forcing the Board to adjourn the meeting to another location. In response to the Board’s denial, the Short’s executed a Specific Power of Attorney granting their attorney the right to attend board meetings on their behalf. Upon the Board’s continued refusal to allow the Short’s attorney to attend the Board meetings, the Short’s filed the lawsuit in question, seeking an injunction against the HOA’s refusal to grant their attorney representative access to the meetings. The lower court found in favor of the HOA, and the Short’s appealed. On appeal, the court found again for the HOA, noting that under Civil Code Section 1363.05, only “members” of the HOA are granted the right to attend board meetings. In relevant part, Section 1363.05 states that, “any member of the association may attend meetings of the board of directors.” Utilizing a combined analysis of 1363.05 and the definition of “member” set forth in the HOA’s governing documents, the court determined that the right to attend and participate in Board meetings does not extend to attorneys, designated representatives, or any other party, other than an “owner” of the property. The court then clarified who may attend Board meetings where an entity, such as SB Liberty, owns property within a HOA. Per the terms of the Corporations Code, the court noted that the business affairs of such entities (LLCs) are managed by either (1) the members, or (2) the manager set forth in the articles of organization. As such, the court concluded that only those individuals are entitled to represent the interests of the LLC during Board meetings. As the Short’s attorney was not an authorized manager or member of SB Liberty LLC, the court determined that there was no basis, either under California statute or the HOA’s governing documents, which supported his right to attend the Board meetings. Although the court’s ruling in SB Liberty provides much needed clarification with respect to the issue of whom is entitled to attend Board meetings, it is important to note that governing documents vary from HOA to HOA, and may therefore contain language granting additional rights or imposing further limitations. As such, prior to denying a non-owner, such as an owner’s attorney, access to a meeting, the Board should perform a thorough review of the language contained in the governing documents, and if necessary, seek the guidance of the HOA’s legal counsel.